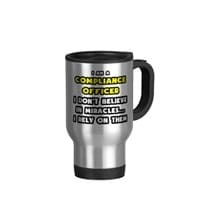 "I am a compliance officer - I don't believe in miracles...I rely on them"
Although the inscription is supposed to be humorous, it got me wondering about how many law firm compliance officers do in fact rely on miracles, or a large amount of good luck, to help them meet their compliance obligations. It is now two years since the COLP/COFA regime was formally introduced, yet market research suggests that many firms are still not where they need to be in relation to their compliance journeys, and many COLP/COFAs are still facing an uphill struggle to embed an effective compliance culture. I agree I am satisfied that I will be able to fully discharge my responsibilities as set out in rule 8.5 (c) of the SRA Authorisation Rules or regulation 4.8 (c) of the SRA Practising Regulations. I confirm that the firm is satisfied that the COLP/COFA nominee(s) will be able to fully discharge their responsibilities as a COLP and or COFA in the firm. The firm has suitable arrangements in place in accordance with rule 8.5(a) of the SRA Authorisation Rules or regulation 4.8 (a) of the SRA Practising Regulations. Unfortunately, the SRA Handbook makes no mention of miracles, so the onus is quite clearly on compliance officers to make sure their firms are meeting their compliance obligations! If you are looking for a competitively priced compliance support service to help you get 2015 off to a good start, give us a call on 01829 731200 or email clientservices@riliance.co.uk.